Dublin haven hath a bar in the mouth, upon which at high flood and at spring tide there is between fifteen and eighteen feet of water, but at the ebbe and nep- tide but six. With an ordinary tide you cannot go to the key of Dublin with a ship that draws five feet of water,but with spring tide you can go with ships that draw seven or eight feet. Those that draw deeper cannot go nearer Dublin than the Rings-end, a place three miles from the bar and one from Dublin. This haven almost all over falleth dry with the ebbe, as well below Rings-end as above it, so you may go dry-foot around the ships which lye at anchor there, except in two places, one at the north side, halfway betwixt Dublin and the bar, and the other at the south side not far from it. 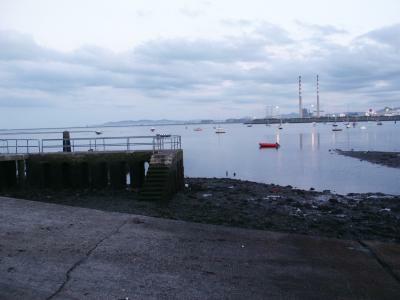 In these two little creeks ( whereof the one is called the pool of Clontarf and the other the Poolbeg) it never falleth dry, but the ships which ride at anchor remain for ever afloat; because at low water you have nine or ten feet of water there. This, besides its shallowness, hath yet another great incommodity, that the ships have hardly any shelter there from any winds, not only such as come out of the sea, but also those that come off the land, especially the south-west; so with a great south-west storm the ships run great hazards to be carried away from their anchor and driven into the sea; which more than once hath come to pass, and particularly in the beginning of November, anno 1637, when in one night ten or twelve barks had that misfortune befaln them, of the most part whereof never no news hath been heard since. When I think of them and their evening songs..... and that years and infirmities begin to oppress me, what is life! 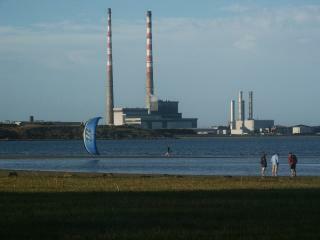 'Molloy Malone' and many Dubliners used to come toIrishtown strand to pick her 'cockles and mussels', which were reputed to be washed up plentifully on this expansive strand. Cromwell and his Round-heads arrived at Ringsend as Lord Lieutenant at the start of his ruthless murdering campaign to banish all the Papist Irish 'to Hell or to Connacht' on behalf of the English parliament in 1649. In the eighteenth century much land was reclaimed from the sea with the confinement of the dear old Liffey, the wild Dodder and the gentle Swan waters and the new found land was called New Holland, probably because of the similar reclaimation work done there along the Zeider sea. The Poolbeg lighthouse took seven years from 1761 to build and it was joined to the mainland at Ringsend by a granite causeway of over 12 km. in length and 10 metre wide at the top. 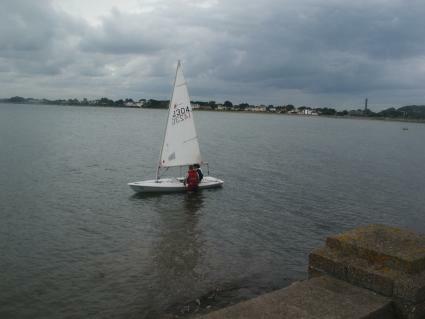 The lighthouse is at the focus of Dublin bay, being equidistant from Dublin, Dun Laoghaire and Howth, commanding panoramic views of the whole coastline and the mountains behind; in former times it was used as a safe anchorage for sailing vessels. The purpose of the very long causeway,called the south Bull wall, was to try and prevent the shifting sands from the south fouling up the approach to the Liffey at the centre of Dublin port.But this did not solve the silting problem and in 1800 Captain Bligh, late of the Bounty, was sent in to find a solution, which was probably one of the few good things that came out of the act of union of Ireland with England, Scotland and Wales.. This much maligned genius did in fact, come up with the solution, which was to build a second causeway, the north Bull wall, north of the river mouth and thus cause the restricted Liffey estuary to flush down to open sea all drifting sand in its path.The opening to the sea at the extreemities of the two bull walls was reduced to only 200 metre. Captain Bligh was the one and only man to have surveyed Dublin bay before or since so as to establish the deep areas for navigation and the position of sndbars and rocky outcrops. Many travellers through Dublin bay owe their lives and safe passage to the good Captain as before his time the bay was notorious for shipwrecks. The festival was established by Royal Charter in 1204 as a diversion for the citizens of Dublin and it was carried on outside the walls of the city on the banks of the Dodder at a place called the 'Forty Acres' where the city slickers could meet the country jackeens and have a party to end all parties renowned for its fighting, dancing, love-making and gaiety; it survived for 600 years until 1855, when some business men raised public funds for a hostile take over of the 'patent' and then let it lapse; not unlike the story of the closing down of Bewleys, those equally famous Dublin Caf�s, at present. 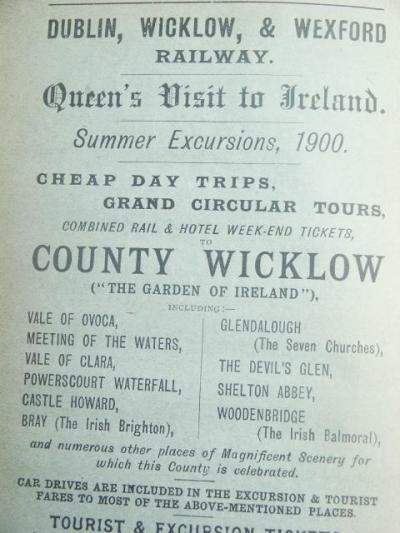 In 1900 the same Forty Acres became the site for the Great Exhibition, opened by no less a person than Her Majesty, the Queen, Victoria; and it was hoped that this Exhibition would show the world that the Irish were no longer a wild fighting lot except when in the service of Her Majesty as food for cannons on the frontiers of Empire. 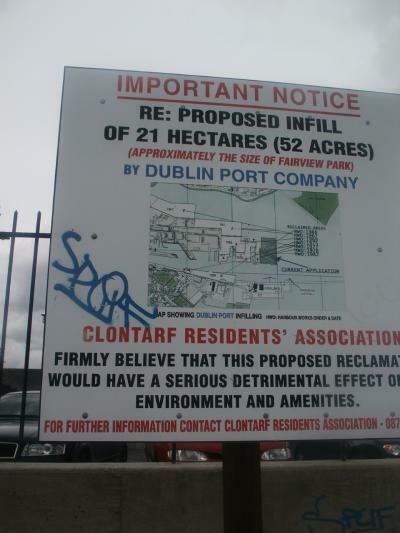 Ever since 1014, when the Irish, under King Brian Boru at the battle of Clontarf, sent the Danes packing for good out of our Fair Isle, the residents of Clontarf and Fairview and the northern side of Dublin bay, in general, have being fighting to keep the sea on their doorstep. Because the sea is quite shallow all along here 'developers' have been tempted to reclaim it in for houses and the fact that they have had some success is evident at Fairview Strand, where the sea is never to be seen now. 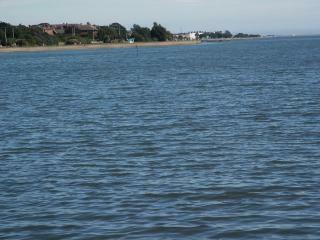 The sea off Clontarf is so shallow that a protrusion about 150metre from the shore was called Clontarf Island. This island was used as a place of refuge and isolation during a plague in the city in 1650 and as a place of recreation years later but it gradually got swallowed up by the sea.